The heart normally beats in a consistent pattern that sounds like ?lub-dub, lub-dub.? This sound, which your doctor hears while listening to your heart through a stethoscope, is the noise the heart valves make as blood moves through them. The heart has four valves that control the movement of blood from the heart?s upper chambers?the atria?to the bottom chambers?the ventricles. Blood flows into the heart through the atria, and back out of the heart to the lungs or the rest of the body through the ventricles. If you have a heart murmur, your doctor will hear an abnormal sound?often a whooshing or swishing?as blood flows through the heart?s chambers and valves. A heart murmur isn?t a condition, but a symptom. Sometimes a heart murmur doesn?t indicate a problem with the heart. This is called an innocent heart murmur. It doesn?t produce any symptoms or problems?other than the murmur itself. And, it doesn?t need to be treated. Innocent heart murmurs are common in newborns and children, as well as during pregnancy. They may go away on their own over time. 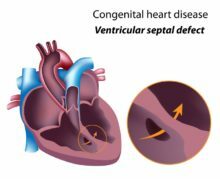 Abnormal murmurs are usually due to a heart defect or valve disease. You?re more likely to develop this type of heart murmur if you have a family history of heart defects, or a condition like high blood pressure, an infection of the heart lining (endocarditis), lupus, rheumatoid arthritis, or a weakened heart muscle. In addition to the heart murmur, you may have symptoms like shortness of breath, chest pain, dizziness, and a bluish color to the skin as the body doesn?t get enough oxygen. An abnormal heart murmur is more serious. You may need treatment such as medicine or surgery to manage the condition that?s causing the murmur. Medicines for abnormal heart murmurs include anticoagulants to prevent blood clots in the heart, water pills (diuretics), angiotensin-converting enzyme (ACE) inhibitors or beta-blockers to lower blood pressure, and statins to lower cholesterol. Surgery can be done to repair or replace a damaged heart valve. Four valves in your heart keep blood flowing in the right direction. Most people give no thought to these valves until they malfunction, causing blood to back up in the heart or lungs or preventing enough blood from reaching vital organs.